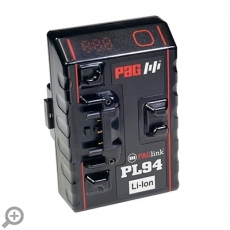 The PAGlink HC-PL94T is a high-current replacement for Anton Bauer Li-Ion batteries. 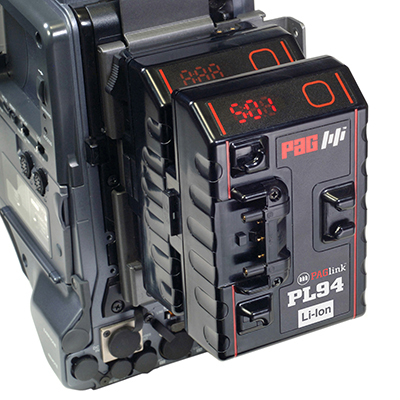 The smaller and lighter PAGlink battery is compatible with the Gold Mount camera plate and with Anton Bauer Li-Ion chargers. There is no need to replace expensive chargers in order to benefit from the many advantages of PAG’s revolutionary, intelligent linking battery technology. PAGlink is the industry’s first intelligent linking battery system. It offers more power, more technological advances and more benefits to camera professionals and than any other battery system. PAGlink batteries can be used individually or linked to power a variety of cameras and equipment used for broadcast acquisition, video production or digital cinematography. 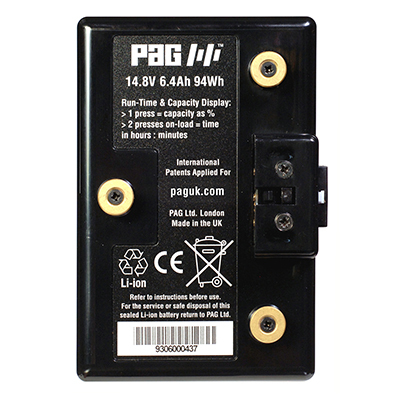 PAGlink is the only system that allows you to combine the capacities of two batteries or more, in any state of charge, to achieve longer run-times or a higher current-draw. Up to 8 batteries can be linked for charge or discharge - an industry first. PAGlink was designed so that flight-friendly battery units that have capacities below 100Wh can be linked to create a high-capacity Li-Ion power source on location. Linking two 94Wh PL94 batteries doubles the capacity to 188Wh; three batteries provide 282Wh. No other system offers as much power. The rated maximum continuous output for an individual battery is 10A, and 12A when batteries are linked. PAGlink offers more power for set-ups that include multiple accessories. Hard-wearing, heavy duty contacts are incorporated for high-current applications. Linking batteries shares the load and contributes to an extended battery life. No other battery system offers such good return on investment. The PL94 is is unrestricted, in quantity, when you fly. Li-Ion batteries that have capacities greater than 160Wh are banned from passenger aircraft. The PL94 has been tested to UN standards by an independent authority and certified to comply with air transport safety regulations. 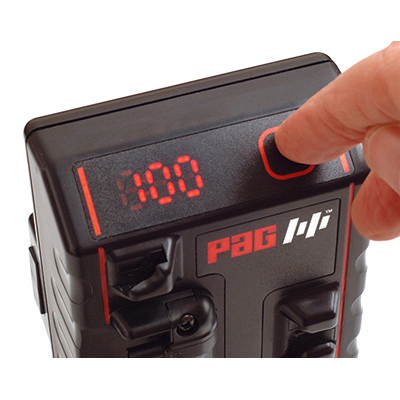 Each PAG Li-Ion battery is labelled with its UN Test number and air travel quantity allowance, based on its capacity. Linked batteries form a network that enables them to communicate with each other, managing the output safely, and preventing the transfer of charge between batteries. Unlike other systems, the linked batteries can be in any state of charge. 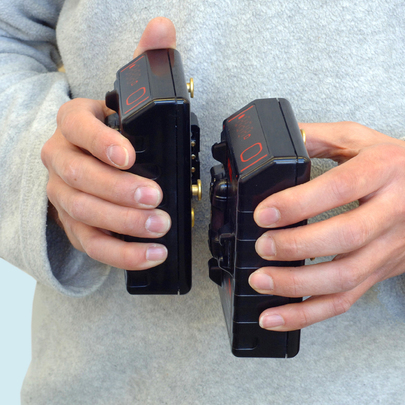 PAGlink also allows batteries to be hot-swapped for continuous, uninterrupted power, putting an end to time-consuming camera reboots during shooting. As well as being more intelligent, PAGlink batteries are smaller and lighter, with a higher energy density than other Gold Mount batteries of equivalent capacity. 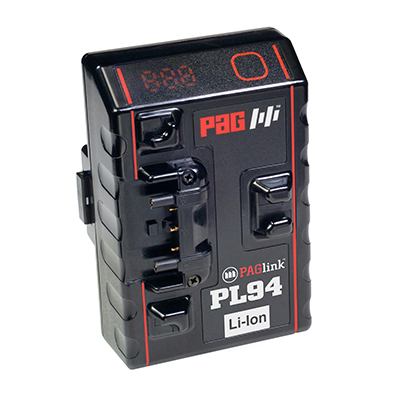 The PL94 can be linked to any other PAGlink Gold Mount battery for charge or discharge, regardless of rated capacity or state-of-charge. 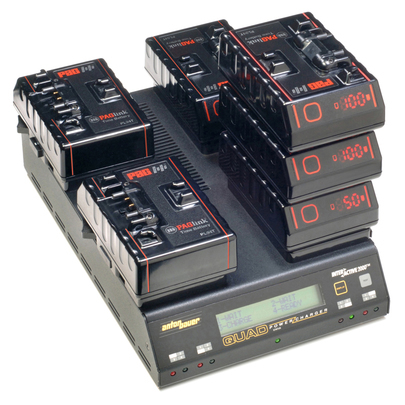 The battery incorporates a numeric Run-Time & Capacity display, unique to PAG. Remaining run-time is shown, on-load, expressed in hours and minutes, to a resolution of 1 minute. When batteries are linked, the run-time figure is for the entire stack, but a single button press shows individual battery capacity as a percentage of full, in 1% increments. The display maintains its accuracy by tracking the performance, and adjusting calibration values to compensate for the ageing of the cells. 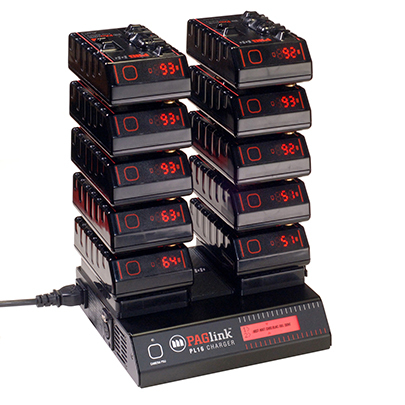 PAGlink batteries communicate automatically with the camera data system that allows Anton Bauer batteries to display their remaining capacity in the viewfinder and LCD. Linked battery charging was developed by PAG and is unique to the PAGlink system. It is more efficient because it allows more batteries to be charged on fewer and smaller chargers, with less user-intervention. PAGlink allows up to 8 batteries of any rated capacity, in any state of charge, to be linked for charging. 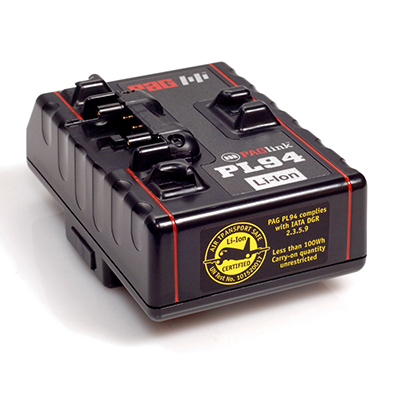 The batteries control their own charge regime which means that Anton Bauer Li-Ion chargers can be used. The number of batteries that can be charged linked is dependent on the charger model and firmware version. Using PAGlink chargers is the best way to ensure the longest possible battery life. 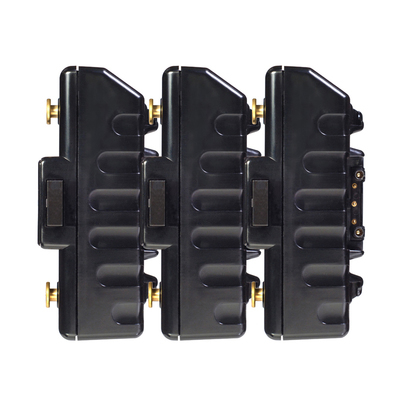 The 2-position PL16 charger (Model 9707A) will charge simultaneously up to 16 PAGlink Gold Mount batteries (8 on each position). Status during charging is indicated on the PAGlink battery’s individual display, which can be inverted for legibility, with a single button press. After being fully-charged, PAGlink batteries can be left safely stacked on the charger, until they are needed. PAGlink batteries store data in their microprocessor, such as number of cycles and software version, which can be revealed using the PAGlink Gold Mount Battery Reader (Model 9647A). This information is designed to make battery management easier and more efficient. PAGlink battery firmware can be updated in the field by the user, in a matter of seconds, without opening the battery case. Updates enable you to benefit from the technological advances that PAG introduces to accommodate developments in camera technology. PAGlink batteries feature long-life, premier-quality Li-Ion cells, which have no memory effect, and are completely recyclable. In keeping with PAG’s total battery design philosophy, PAGlink batteries are constructed to provide the longest possible working life. The battery features a multi-level electronic protection system which is fail-safe and guards against conditions that reduce battery life. The circuits are coated to protect them from electrolyte and ensure the operation of the safety systems in the event of damage to the battery. Run-Time & Capacity Display: Numeric display that shows a run-time prediction on-load, expressed in hours and minutes, to a resolution of 1 minute. Capacity/state of charge is displayed as a percentage, in 1% increments. Construction: High-impact polycarbonate injection mouldings designed to protect the cells from impact damage. Replaceable Contact Assemblies: The front and rear contact assemblies are external to the battery case and can be replaced if damaged. Cells: Premium grade, high-current, sealed Lithium-Ion rechargeable cylindrical cells. Voltage: 14.8V nominal. 12 cells connected in series/parallel. Each cell has a nominal voltage of 3.7V. 94 Watt-hours. Nominal 6.4 Ampere-hours. Output Current: Rated maximum continuous output current 10 Amperes, 120W-150W (for two or more linked batteries 12 Amperes, 150W-180W). The multi-layered electronic protection system guards against over-current, over-voltage, under-voltage, over-temperature and under-temperature. The protection system circuit is conformally-coated to protect it, and ensure operation of the safety systems in the event of damage to the battery. Charging: 0°C to +40°C (Optimum +10°C to +30°C). Discharging: -20°C to +50°C (Optimum +5°C to +40°C). Storage: -10°C to +40°C (Optimum 0°C to +20°C).